During the recent years, cinacalcet has markedly improved the management of hyperparathyroidism in patients on hemodialysis. However, to the best of our knowledge, there are no specific studies addressing the dose regimen of cinacalcet. The aim of the study was to evaluate the efficacy of cinacalcet on the achievement of targets in the treatment of hyperparathyroidism in two different dosage schedules. Twenty-seven adult patients who were on hemodialysis for more than four months and with severe secondary hyperparathyroidism (intact parathyroid hormone (iPTH) >88 pmol/L) resistant to conventional treatment were included in this prospective study. We used the targets of K/DOQI-clinical guidelines as optimal target of iPTH, calcium and phosphate. Group 1 received a single daily administration of 30 mg of cinacalcet along with the main meal as the starting dose, and the dose was titrated thereafter monthly. Group 2 received cinacalcet with the main meal twice weekly starting with a dose of 90 mg on the first day of the week and 120 mg at midweek and titrated thereafter monthly. The levels of iPTH decreased significantly (P = 0.0001) from 124.00 ± 44.77 pmol/L to 37.78 ± 12.49 pmol/L and from 109.61 ± 53.13 pmol/L to 33.93 ± 12.03 pmol/L after 12 weeks in groups 1 and 2, respectively. After 12 weeks, alkaline phosphatase declined significantly (P = 0.0001) from 143.42 ± 75.20 IU/L to 87.42 ± 14.46 IU/L in group 1 (P = 0.013), and from 148.00 ± 108.49 IU/L to 101.61 ± 46.62 IU/L in group 2 (P = 0.05). There were no significant differences between the reductions of iPTH, calcium phosphate product and alkaline phosphatase levels in both the groups in the vertical comparison at the end of the study. There was no noteworthy difference in side effects between both the groups. Our results indicate that cinacalcet twice weekly is reasonably safe and effective in suppressing high PTH levels in hemodialysis patients, with fewer side effects. We hypothesized that the intermittent dosage of oral cinacalcet would be as effective as regular dosages in treating secondary hyperparathyroidism in hemodialysis patients. We also thought that the new dose regimen will lower the adverse effects. Under this notion, we conducted a randomized trial in chronic hemodialysis patients with severe secondary hyperparathyroidism (iPTH more than 88 pmol/L). Twenty-seven adult patients with end-stage renal disease, who had been on maintenance hemodialysis for more than four months, were included in this prospective trial. Eligibility criteria included severe secondary hyperparathyroidism with intact PTH ≥88 pmol/L. All patients were compliant and adequately dialyzed. All patients were refractory to vitamin D derivatives. Patients were considered refractory if iPTH was not reduced to the target, developed hypercalcemia and/or hyperphosphatemia. All patients were recruited from our dialysis unit. Patients were told about the study and informed consent was obtained from all the patients. Patients with malignancy, active infection, calcium corrected for albumin less than 2.2 mmol/L, diseases causing hypercalcemia, chronic liver disease, pregnancy and concurrent use of medications metabolized by cytochrome P-450 2 D6 were excluded. All patients were on dialysis treatment three times per week, receiving 12 hours weekly, and four hours per session. Polysulfone dialyzers and bicarbonate bath with dialysate calcium concentration 1.25 mmol/L, sodium concentration of 136 mmol/L were used for dialysis. Blood flow rate was 300 mL/min or more and dialysate flow rate was 800 mL/min. All patients were receiving recombinant erythropoietin intravenously two to three times post dialysis. The treatment protocol consisted of 4 weeks washout period followed by a treatment period lasting up to 12 weeks. Meanwhile, medical charts of the selected patients were reviewed to extract the basic data, and patients were also interviewed to explain the objective of the study. All eligible patients were randomly assigned to two groups. Group 1 (control group) had 14 patients and they received an initial dose of 30 mg of cinacalcet, along with the main meal, as a single daily dose. The dose of cinacalcet was increased every four weeks sequentially to 60 and 90 mg/day if the iPTH value did not get decreased by 50% or more from the baseline value. Group 2 (intervention group) had 13 patients and they received cinacalcet, given with the main meal twice weekly, starting with the initial dose as 90 mg on the first day of the week and 120 mg at midweek (total dose 210/week) and titrated monthly thereafter. If the iPTH value did not get decreased by 50% or more from the baseline, the dose of cinacalcet was increased every four weeks sequentially to 210 mg (total dose 420/week), and 315 mg (total dose 630/week) twice weekly. 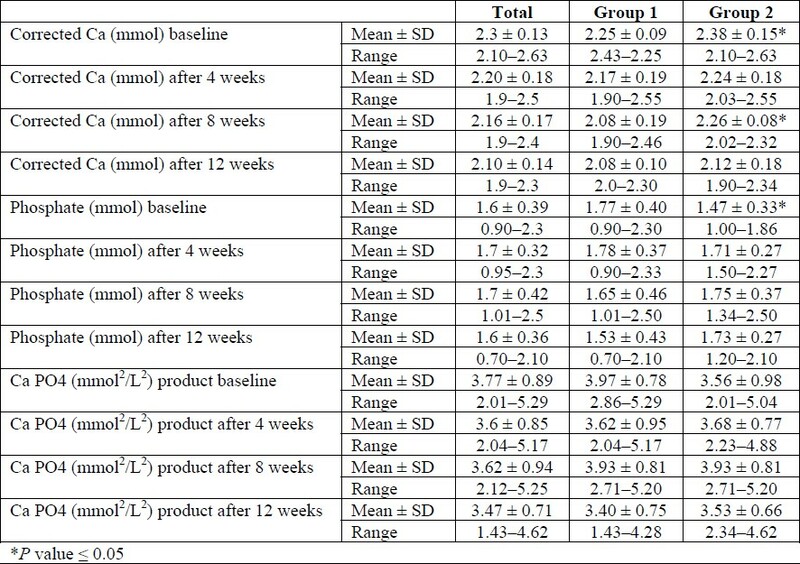 The active vitamin D derivative dose was maintained at the lowest dose (alfacalcidol 0.25 μg/day) during the study period. The active vitamin D derivative was increased when the patient had a serum Ca level <2.1 mmol/L or patients exhibited symptoms of hypocalcemia. All symptoms and signs, either observed by the investigators or reported by the subject spontaneously or in response to a direct question, were noted. We used the targets of K/DOQI-clinical guidelines as optimal target of iPTH, calcium and phosphate. The dose was adjusted when the mean iPTH level reached 32 pmol/L or less, or if the iPTH declined from the baseline by more than 50%. Serum albumin corrected calcium, phosphate, alkaline phosphatase and iPTH were measured. The baseline laboratory investigations were measured after randomization of the subjects. Serum albumin corrected calcium, phosphate and alkaline phosphatase were measured weekly. iPTH was measured every four weeks using Coat-A-count immunoradiometric assay method (Diagnostic Products Corporation, Los Angeles, CA, USA). The primary end point was achieving the target iPTH levels while the secondary end point was achieving the target level of corrected calcium, phosphate, calcium/phosphate product, alkaline phosphatase and/or developing severe adverse effects. The Statistical Package for Social Sciences (SPSS, Chicago, IL, USA) was used for data processing, using the cut-off level for significance as P ≤ 0.05. The various descriptive statistics (Mean, Standard Deviation) were used to describe the variables. Chi-Square test, independent samples "t" test and paired samples "t" test were used to find the association between two independent variables as appropriate. Demographic characteristics of the patients are given in [Table 1]. There was no significant difference in age, gender or the type of renal diseases. Duration on dialysis was significantly longer in group 2. Diabetic nephropathy was the commonest cause of stage 5 renal disease in all the studied patients. Coronary artery disease, cerebrovascular disease, hypertension, dyslipidemia and peripheral arterial disease were the commonly noted co-morbid diseases among our patients. No chronic liver disease was noted among the studied patients. The erythropoietin dose was 4828 ± 2138 and 4723 ± 2100 units/week in groups 1 and 2, respectively. Table 1: Baseline demographic characteristics of the patients. Laboratory parameters are given in [Table 2]. Notably, albumin corrected calcium was significantly higher in group 2 at the baseline parameters, after eight weeks of treatment. However, calcium/phosphate product was not significantly different during the same period of treatment. Two patients from each group required an increased dose of active vitamin D derivatives because of asymptomatic low calcium. All selected patients were adequately dialyzed with Kt/V more than 1.2. Table 2: Albumin corrected calcium, phosphate and calcium phosphate product in both groups. Angiotensin II receptor blockers (ARBs), angiotensin converting enzyme inhibitors (ACE-I), β blockers, and calcium channel blockers (CCB) were the preferred anti-hypertensive drugs. [Figure 1] shows that iPTH declined significantly (P = 0.0001) from 124.00 ± 44.77 pmol/ L to 37.78 ± 12.49 pmol/L, and from 109.61 ± 53.13 pmol/L to 33.93 ± 12.03 pmol/L after 12 weeks in groups 1 and 2, respectively. Figure 1: Correlation between intact parathyroid hormone and treatment weeks. [Figure 2] shows that after 12 weeks, alkaline phosphatase declined significantly (P = 0.0001) from 143.42 ± 75.20 IU/L to 87.42 ± 14.46 IU/L in group 1 (P = 0.013), and from 148.00 ± 108.49 IU/L to 101.61 ± 46.62 IU/L in group 2 (P = 0.05). There were no significant differences between the reductions of iPTH, calcium/phosphate product and alkaline phosphatase levels in both the groups in the vertical comparison at the end of the study. Figure 2: Correlation between alkaline phosphatase and treatment weeks. 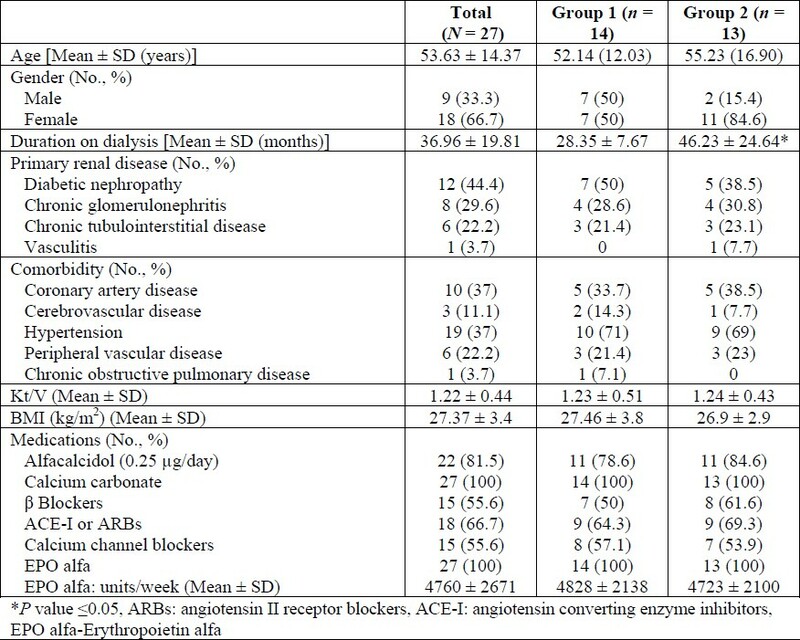 [Table 3] shows the adverse effects in both the groups during the first four weeks. Nausea was commonly seen during the first two weeks and disappeared during the second 2 weeks. In group 2, however, these symptoms were reported only on the day when they received the drug. There were no noteworthy differences in the side effects between both the groups. Table 3: Adverse events in both groups during the first 2 weeks and second 2 weeks. Management of secondary hyperparathyroidism in CKD has developed based upon new insights into the pathogenesis and clinical features of this disorder. The 2003 K/DOQI practice guidelines  and The 2009 KDIGO practice guidelines  were developed to provide recommendations for the evaluation and management of chronic kidney disease-mineral and bone disorder (CKD-MBD). These guidelines were formulated in an attempt to minimize the morbidity and mortality associated with abnormal mineral metabolism, abnormal bone processing, possible cardiovascular toxicity, vascular calcification and extra-skeletal calcification associated with the current therapies. The development of new therapeutic agents that can suppress PTH without exacerbating hyperphosphatemia or causing hypercalcemia is the intention of research into this issue. To the best of our knowledge, there are no specific studies addressing the dose regimen of cinacalcet. Usually, cinacalcet is initiated at a dose of 30 mg/day, with stepwise increments to 60, 90 and 180 mg/day. We conducted this study dividing the patients into two groups, Group 1 taking the standard dosage and Group 2 to whom the drug was administrated in a higher dose, but twice weekly. Our results showed that the treatment of hemodialysis patients having severe secondary hyperparathyroidism with cinacalcet, was efficacious and well tolerated both among the patients taking the standard dosage and also in those whom the drug was administrated in a higher dose twice weekly. Significant reduction of iPTH to the target level and the calcium/ phosphate product of less than 4.44 mmol 2 /L 2 was achieved in our study. Calcium × phosphate product was also not significantly different in the two groups. Even though the half life of cinacalcet is 30-40 hours,  it seems that pulsing the drug twice weekly is equally effective in making CaSR more sensitive to calcium. Notably, upper gastrointestinal symptoms were prominent in the first two weeks in both the groups in accordance with what has been reported by others. However, no significant difference was observed between the two groups. These adverse events markedly decreased by the end of the first month in both the groups. Compliance to treatment is an important aspect for the effectiveness of any drug. As per observation in this study, those patients who received twice weekly dose were symptomatic only on the day they received cinacalcet. Therefore, twice weekly high dose regime might be a better option among non-compliant patients. In summary, these results indicate that cinacalcet twice weekly is an effective therapeutic intervention that suppresses PTH in patients with severe hyperparathyroidism and has less upper gastrointestinal side effects. In this trial, the number of the selected patients was a limiting factor due to the expanded exclusion criteria in the face of narrow inclusion criteria. Further studies in a large scale are required to confirm the effectiveness of cinacalcet as twice weekly dose. 1. Hruska, KA, Teitelbaum, SL. Mechanisms of disease: renal osteodystrophy. N Engl J Med 1995;333:166. 2. Fournier A, Morinière P, Ben Hamida F, et al. Use of alkaline calcium salts as phosphate binder in uremic patients. Kidney Int Suppl 1992;38:S50. 3. K/DOQI Clinical Practice Guidelines for Bone Metabolism and Disease in Chronic Kidney Disease. Am J Kidney Dis 2003;42:S1. 4. Martin, KJ, Gonzalez, EA. Metabolic bone disease in chronic kidney disease. J Am Soc Nephrol 2007;18:875. 5. Brown EM. Calcium receptors and regulation of parathyroid hormone secretion. Rev Endocr Metab Dis 2000;1:307-15. 6. Sensipar™ (cinacalcet HCl) package insert. Thousand Oaks, CA: Amgen; 2004 Mar. 7. KDIGO clinical practice guidelines for the diagnosis, evaluation, prevention, and treatment of chronic kidney disease-mineral and bone disorder (CKD-MBD). Kidney Int 2009;76 (Suppl 113):S1. 8. Padhi D, Harris R. Clinical pharmacokinetic and pharmacodynamic profile of cinacalcet hydrochloride. Clin Pharmacokinet 2009;48(5):303-11. 10. Vulpio C, Bossola M, De Gaetano A, et al. Parathyroid gland ultrasound patterns and biochemical findings after one-year cinacalcet treatment for advanced secondary hyperparathyroidism. Ther Apher Dial 2010;14(2):178-85. 12. Nemeth EF. Calcimimetic and calcilytic drugs: just for parathyroid cells? Cell Calcium 2004; 35:283-9. 13. Yamamoto M, Igarashi T, Muramatsu M, Fukagawa M, Motokura T, Ogata E. Hypocalcemia increases and hypercalcemia decreases the steady-state level of parathyroid hormone messenger RNA in the rat. J Clin Invest 1989; 83:1053-6. 14. Nemeth EF, Bennett SA. Tricking the parathyroid gland with novel calcimimetic agents (editorial). Nephrol Dial Transplant 1998;13: 1923. 15. Sterrett JR, Strom J, Stummvoll HK, et al. Cinacalcet HCI (Sensipar/Mimpara) is an effective chronic therapy for hemodialysis patients with secondary hyperparathyroidism. Clin Nephrol 2007;68:10. 16. Sprague SM, Evenepoel P, Curzi MP, et al. Simultaneous control of PTH and CaxP Is sustained over three years of treatment with cinacalcet HCl. Clin J Am Soc Nephrol 2009; 4:1465. 17. Arenas MD, Alvarez-Ude F, Gil MT, et al. Implementation of 'K/DOQI Clinical Practice Guidelines for Bone Metabolism and Disease in Chronic Kidney Disease' after the introduction of cinacalcet in a population of patients on chronic haemodialysis. Nephrol Dial Transplant 2007;22:1639. 18. Fishbane S, Shapiro WB, Corry DB, et al. Cinacalcet HCl and concurrent low-dose vitamin D improves treatment of secondary hyperparathyroidism in dialysis patients compared with vitamin D alone: The ACHIEVE study results. Clin J Am Soc Nephrol 2008; 3:1718. 19. Padi D, Harris R. Clinical pharmacokinetic and pharmacodynamic profile of cinacalcet hypochloride. Clin Pharmacokinet 2009;48:303-11. 20. Chertow GM, Blumenthal S, Turner S, et al. Cinacalcet hydrochloride (Sensipar) in hemodialysis patients on active vitamin D derivatives with controlled PTH and elevated calcium x phosphate. Clin J Am Soc Nephrol 2006;1(2):305-12. 21. Arenas MD, Alvarez-Ude F, Gil MT, et al. Implementation of 'K/DOQI Clinical Practice Guidelines for Bone Metabolism and Disease in Chronic Kidney Disease' after the introduction of cinacalcet in a population of patients on chronic haemodialysis. Nephrol Dial Transplant 2007;22(6):1639-44. 22. Meola M, Petrucci I, Barsotti G. Long-term treatment with cinacalcet and conventional therapy reducesparathyroid hyperplasia in severe se condary hyperparathyroidism. Nephrol Dial Transplant 2009;24:982-9. 23. Dong BJ. Cinacalcet: An oral calcimimetic agent for the management of hyperparathyroidism. Clin Therap 2005;27(11):1725-51. Liu, W.-C. and Hsu, C.-C. and Lu, K.-C.